Kingdom of Thailand is still a very desirable place to visit and despite the economic turmoil in the western world, arrival figures are expected to reach record heights for 2013. Foreign tourists reached nearly 9 Million for the first 4 months and a total of 25.4 Million arrivals are expected for 2013, regarding Kasikorn Research Center. Foreign tourists should find it safer to travel within Thailand now due to the easing of political tensions, the best value for money will continue also to be an important factor toward luring international tourists to Thailand this year. Thai tourism exhibited steady growth in international tourist arrivals, led by Chinese and Russian arrivals. It is expected that the number of Chinese tourists will reach about 3.8-4.0 million this year, beating the 2.76 million reported for 2012. The number of Russian tourists will likely grow 19.1 percent YoY to about 1.56 million arrivals. We have seen a massive increase in new direct flights recently, new routes from UAE, India, or China. 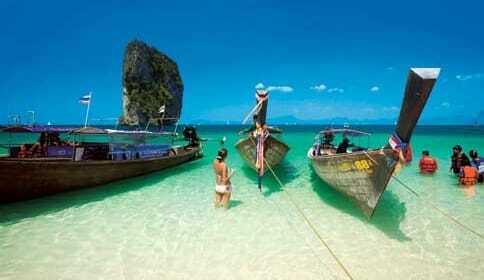 Spring Airlines is about to launch a three times per week Phuket-Shanghai-Phuket service staring on 26 June. The A620 airbuses that seat 180 passengers will depart from Phuket International Airport on Tuesdays, Thursdays and Saturdays. South korea’s charter flyer Business Air is also to begin direct flights between Incheon Airport in Seoul to Phuket International Airport from 3 September 2013. Phuket is once again looking forward to the high season influx with baited breath, looking to break some more inbound visitor records along the way.